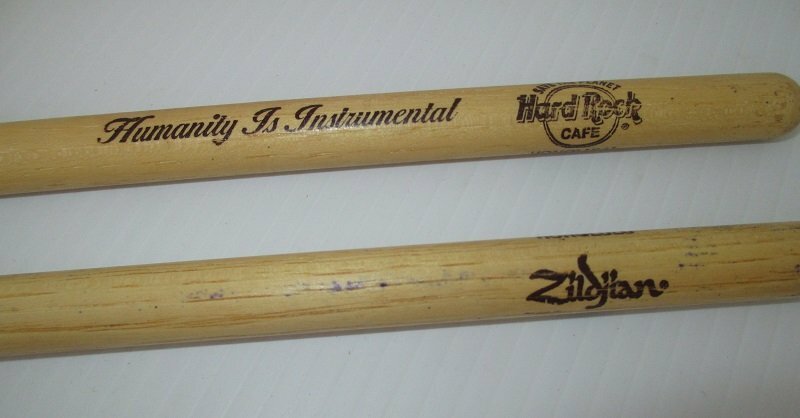 16.5 inch Hickory Wood drumsticks from the Hard Rock Cafe in Honolulu Hawaii. Marked Zildjian and Humanity is Instrumental. Nylon tips. One pair consisting of 2 drum sticks. They are marked Hard Rock Cafe Honolulu. They are also marked Zildjian and Humanity is Instrumental. They measure 16.5 inches long including the nylon tips. Researching these, I saw a couple of references to them being made from Hickory wood. They have been used as you should be able to see in my photo. I would have cleaned them, but I've no idea what to use so I'll leave that to the new owner. As to the amount of usage, I don't know as I obtained them at an estate sale. I examined the nylon tips using a jeweler's loop and see no cracks or chips. There are also no cracks or chips in the drumsticks. Buyer to pay $5.20 USPS First Class Mail delivery charges. All items in my listings come from estate sales, garage sales, or various auctions. I do not know if they came from homes where smoking or pets were present. All items are sold in the same condition as when I received them.